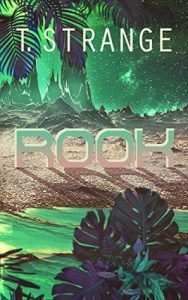 I received a copy of Rook , by T. Strange from Netgalley. For killing his husband, Rook is sent to B-226—an alien planet populated by deadly creatures, where the average life expectancy for a prisoner is three weeks. Rook is relieved by the sentence—all he wants is to die and rejoin his husband. Upon arrival on B-226, Rook is partnered with Stevie, who has beaten the odds and survived for several months. Rook is drawn to Stevie in a way he didn’t expect in the aftermath of losing his husband. Before Rook can untangle the mess of his emotions, the already deadly situation on B-226 worsens, plunging Rook and Stevie into an even more desperate struggle to survive. This book has an interesting blurb. Man gets sent to a prison planet, is partnered with a slightly more experienced prisoner, and feels drawn to him. That’s the basics of the blurb. It’s also the basics of the book. There is almost nothing more to the book than is in the blurb, which is fine, except that the book is 218 pages long. That is nowhere near enough plot to fill 218 pages. Nowhere. Near. Enough. The book is just FAR TOO LONG for the plot points it contains and the last 1/4 or so of it is just almost completely tell about what happens after….well, after the book should have ended. The copy editing is pretty good, but there are a few consistency problems. (Hopefully those get cleaned up in the final edit. I read an ARC.) But there are some frankly ridiculous occurrences that I can’t really discuss without spoilers—finding things they need conveniently abandoned or knowing things immediately from little available information—that sort of stuff. OK, this is a spoiler (be warned), but I have to say it, the occurrences and decision that get them off the planet and home was just more than I could believe. The government does not just suddenly decide to let prisoners they’ve convicted to death go free! I don’t care what favor you did or what new information was miraculously discovered. I do appreciate that Strange death with depression, PTSD and readjustment after the characters went through something traumatic. And I didn’t hate the book. But I think it needed to be pared down quite a bit. This entry was posted in books/book review on March 6, 2018 by Sadie.